Correction: The original article referred to Mike Callan as Mark. It has been updated within the post. Tony Bryan’s drill sergeant graduation. Bryan attended Webster University’s Fort Leonard Wood to earn his MBA while stationed there. Fort Leonard Wood is located in the Missouri Ozarks and is one of Webster University’s 39 military installations. Tony Bryan has worn many hats in his 35 years. He’s worn ball caps as a coach for his kid’s sports teams, a drill sergeant’s campaign hat during his career in the U.S. Army and a graduation cap when he graduated with his MBA from Webster University in 2008. Bryan was discharged from the army in 2007, and since then he has built his career working for several non-profit companies. Bryan works as the director of development and communication at the Center for Autism Education. “‘Come play ball with me, Tony,’ is one of my favorite things to hear at the office, and I’m reminded how cool my job is,” Bryan said. He said he owes his successful career to his military training and to the education he received through Webster, an opportunity he attributes to Webster’s commitment to veterans. Bryan said his G.I. bill, a post-9/11 education benefit that provides financial assistance for military personnel, influenced his decision to attend university. Webster’s partnership with the military concerning education began in 1974, when the university was asked by the Department of Defense to offer its programs at Fort Sheridan in Lake County, Ill. Today, Webster has added 39 military installations that educate more than 7,700 students around the world. Brig. Gen. Mike Callan USAF (Ret.) is the associate vice president for military and governmental affairs for Webster. Callan works to expand education opportunities and ease-of-access for military personnel. “Webster creates the perfect marriage of student willingness and accessibility,” Callan said. Prior to joining the military, Bryan said he found higher education tiresome. He attended Saint Louis University after high school but was not motivated to succeed. After three failed semesters and $25,000 in student debt, Bryan put his dream of becoming a pediatrician on hold. At 19 years old with a four-year-old child and three failed semesters of college, Bryan said he made the most influential decision of his life: he joined the U.S. Army. “My first two years I didn’t really try. I thought I would do my five years and get out,” Bryan said. Bryan did not expect to make the military a career, but he said the support of people around him pushed him in that direction. 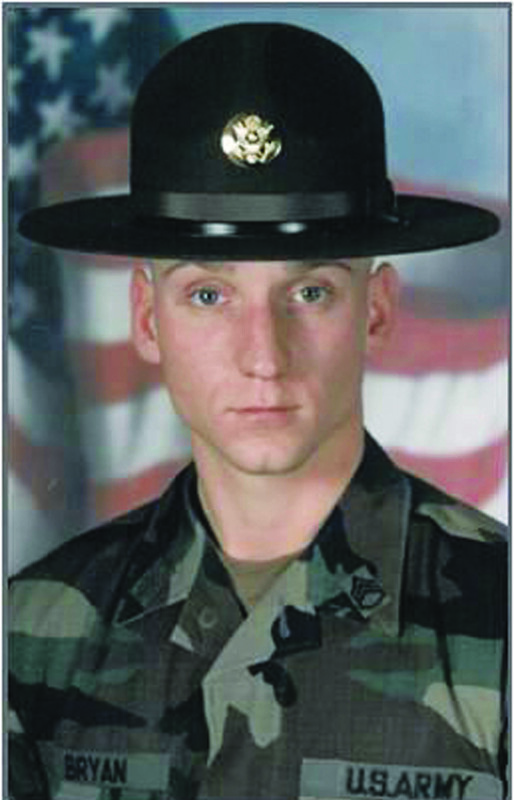 Bryan became a staff sergeant, a position noted for leadership and experience. During his rise in rank he was mentored by Lieutenant Colonel Mark Weber, a man he said impacted his life in many ways. Bryan said friendship between a non-commissioned officer and a lieutenant colonel was uncommon due to the difference in ranking, but they just hit it off. Weber pushed Bryan to better himself and encouraged his decision to attend drill sergeant school. 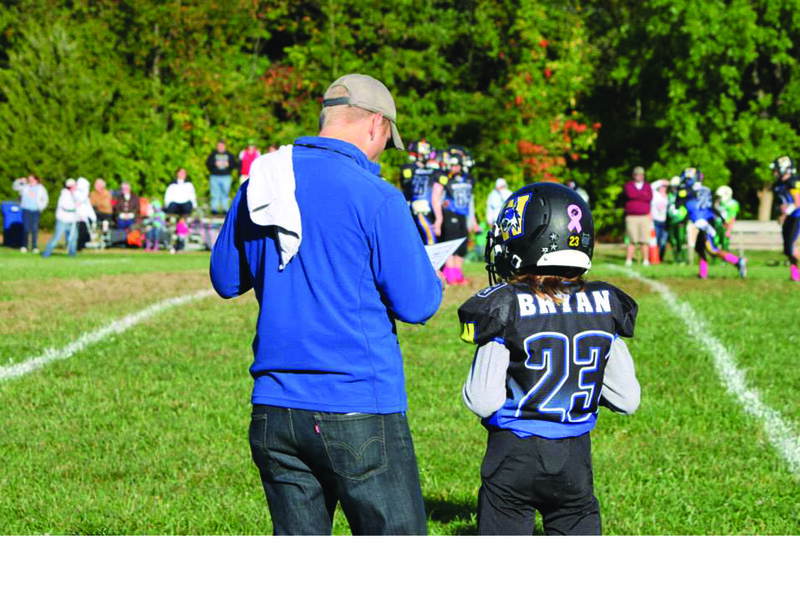 Tony Bryan coaches his 11-year-old son Elijah’s football team. Bryan and his wife of nearly 20 years have four children. nothing like one sees in the movies. Bryan was in charge of molding new recruits and teaching them to take care of themselves properly. He said it was a tough job with a lot of challenges, but helping a civilian transition to a soldier was worth it. Bryan said becoming a drill sergeant enabled him to do more than boss people around. The position granted him career opportunities he had never considered and set him down a certain career path. The military gave him the confidence and maturity to return to college. First he earned a Bachelor of Business from Columbia College in 2004. Toward the end of his military career he decided to return to school and found Webster University to be the right fit. Bryan was stationed in Fort Leonard Wood during his time at Webster. He said he appreciates the effort Webster puts forth to help veterans prosper, a mission he said he feels equally passionate about. Bryan said he is not motivated by money but rather defines success as being happy in what he does. “As long as I can pay my bills and provide for my kids, then life is good,” Bryan said. Bryan said his time in the Army instilled many valuable characteristics in him. Passion, pride, respect, humility, punctuality, cleanliness and determination are qualities he said have benefitted him. He said his passion for helping others is what fostered his career in non-profit. Bryan started his non-profit career in the development center at The Mission Continues, an organization dedicated to veteran welfare. Bryan said he was greatly influenced by Eric Greitens, founder of The Mission Continues, to continue his career serving others. Greitens taught Bryan to connect with his mission and to be motivated by people. 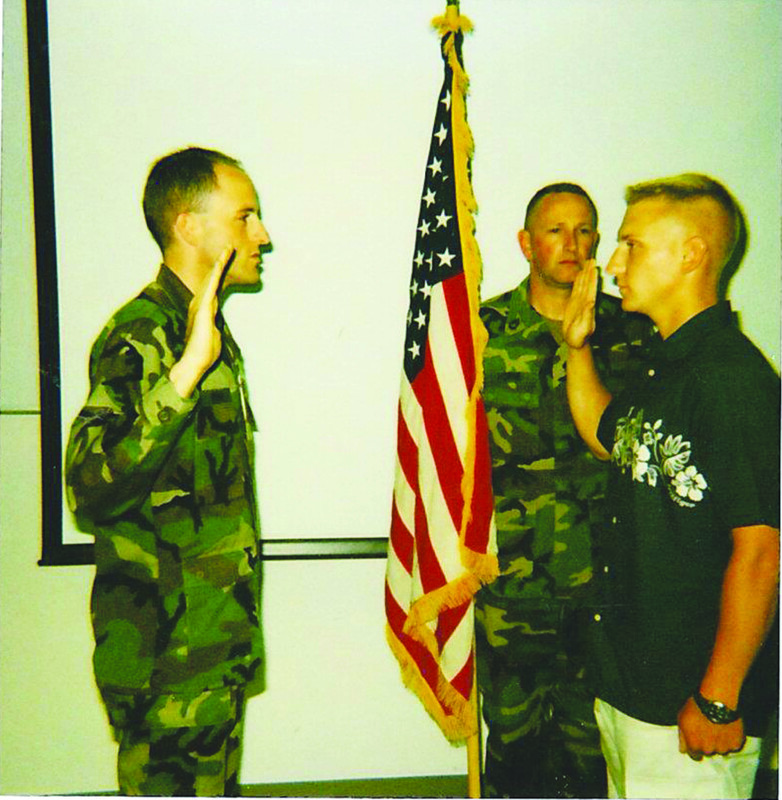 Lieutenant Colonel Mark Weber (left) reenlists Tony Bryan (right). Bryan said Weber played a role in his decision to attend drill sergeant school. Bryan left the foundation in 2012 but said he cherishes what a difference his time there made in his life. Bryan’s career is in non-profit — currently with the Center for Autism Education — but he said family is his life. Bryan and his wife Katie Bryan have been together for nearly 20 years. They have four children. The oldest, Nolan, is 18, followed by Elijah, 11, and 10-year-old twins Caleb and Chloe. Katie Bryan works for a pharmaceutical company from home. She said Tony Bryan does his fair share of the housework. Katie Bryan said she misses the time her family spent around the military. She said the camaraderie they shared with similar families has been hard to find elsewhere, but the military ways have not entirely been forgotten. “Every morning our three youngest children are allowed a timed four-minute shower,” Katie Bryan said. She said Tony Bryan has been a model of responsibility for the entire family. “In nine years he has never called off work, and he is as committed to his family as he was to his soldiers,” Katie Bryan said. Tony Bryan and his family currently live in Wentzville, Mo. He said he has plans to run for alderman and hopes to make a change in his community. “I have worked in St. Louis and around the world; it is time for me to give back in my home town,” Tony Bryan said. Tony Bryan said his life is run by a few simple rules: being on-time is arriving 15 minutes early, always look someone in the eye when shaking their hand, and there are no excuses; just do it.